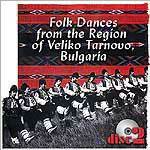 This CD is composed of 23 musical pieces of authentic folk dances, performed by Zornitsa orchestra, Sofia - Bulgaria. There are a few folk songs included in the CD, presented by folk singer Hristina Boteva (3, 17, 21, 22, 23). The music on the CD is taken from the book of Ivan Donkov - "Folk Dance from the Region of Veliko Tarnovo, Bulgaria"
2 Na edna strana 7/8 2'19"
5 Tritja pati 5/8 2'18"
7 Do tri pati [Gradisko horo] 5/8 3'24"
8 Cesta krivica 2/4 2'46"
11 Cetiri lakti 9/8 2'24"
12 Na dve strani 2/4 1'48"
17 Burjano, Burjanke 2/4 3'15"
22 Mnogo hodih, mamo 7/8 2'12"
23 Mar momicence, pticence 5/8 1'32"